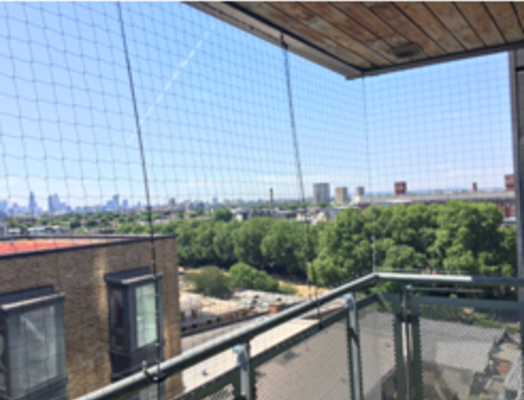 We can supply and professionally install a retractable pigeon netting system retracting up to 4.5m in width that you can just simply pull back using our (PNS) Pillar Unit, and shut to prevent pigeons from entering your balcony when required. The PNS Pillar Unit is bespoke, and made to be installed to your balcony with dimensions of 150mm x 50mm plus the height of the balcony opening, and will adjust to fit in between your balcony and the underside of the balcony above. here is also the new PNS Pigeon Netting System Compact Stealth retractable system which consists of two small retractable boxes installed on the balcony safety rail and the underside of the above balcony. The Compact Stealth is mainly used for protruding balconies and is smaller than the Pillar Unit. Pigeons can perch and fowl the walls and walkway below. Cleaning with biocide disinfectants were used for this solution, along with pigeon netting in-between each post.